I first had a parsnip soup at the La Prunelle restaurant in Montreal (a restaurant that I’ll highly recommend). It was a bit of an accident, because all I knew was that I was having a “soupe au panais”. It was not until I got home afterwards that I figured out that it was a parsnip soup. 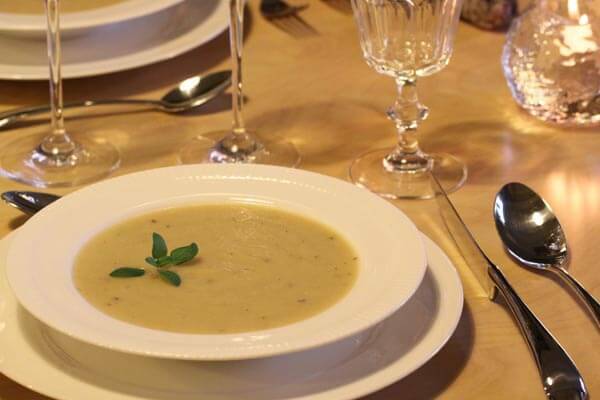 So my next step was to dig up a parsnip soup recipe, because it was absolutely delicious. The ingredient list for the soup is relatively basic. Other than the parsnips and shallots, I usually have all the ingredients in the kitchen. So whenever parsnips catch my eye at the market, all I have to remember is to pick up a few shallots, and I’m good to go. The recipe starts by sautéing the diced parsnips until nicely browned, which really gives a nice depth to the soup. Finishing the soup with parmigiano reggiano, soy sauce and lemon juice provides the perfect foil for the roast parsnip flavour.